The great walk-out from government work, culminating in 2027, was the reason it evaporated. Nobody had lifted a hand or a shotgun against it, nobody had voted it out, and few had even withheld tax payments until a year or two prior--it merely disappeared with a whimper when nobody showed up to the office. This was a truly elegant implementation of de la Bo'tie's five-century-old advice to "withdraw support" from the Colossus. It succeeded completely--at Federal, State and local levels--and will never be needed again, except in every other country in the world, whose populations are busy re-educating themselves now, in preparation for exactly similar revolutions there, and have their governments trembling in their jackboots. The walk-out began before 2010, but in the nature of exponential growth there was little or no tangible, noticeable bite to the process until about 2022. After then it gathered pace fast and by 2025 panic began to set in among the ruling class. Hey, what good is it to write laws and issue orders when nobody is there to enforce and implement them? Then by E-Day in 2027, it was all over. Every member of the entire population had each taken back his own life and those employed by him had told the tyrant, "Take this job and shove it"--and in America , at least, the Age of Government was finally over. The first thing everyone learned in the Academy about work is that absent government force, one's services are worth what an employer volunteers to pay for them; neither more nor less. So as E-Day approached, some were eager and ready to find new ways to present their skills to the marketplace and earn more, while others knew that they were overpaid (because government force had excluded potential rivals) and so anticipated a reduction accompanied by those priceless assets, a clear conscience and high self-respect. All, of course, knew that what we earned, we would keep--for there is no longer any tax. Nor is there any work wasted trying to arrange one's affairs so as to minimize taxes, nor time lost in the creative preparation of tax returns. The value of that lost time amounted to around 14,000 tons of gold in 2023; now, it's all applied to the productive economy. That much is well enough known, and well celebrated. I write today about what's been happening in the three years since, in the matter of work--of how people earn a living in the new, free society. The first fact of life at work is that unemployment is zero. Nobody who wants a job has been unable to find one, after the usual period of search and negotiation; for as in every true free market, there is always a price at which goods and services clear. No minimum wage law prevents an unskilled black teenager, for example, placing his foot on the first rung of the ladder of success, as they did during the previous 60 years; so there are no longer gangs of aimless, resentful youths roaming the streets looking for trouble. Crime--or, rather, aggression, since "crime" was just a government word meaning the breaking of a law, of which none any longer exist--has accordingly dropped like a rock. Further: in a very few more years there will no longer be any unskilled teenagers, of any race; for all of them will have been properly educated. That doesn't say everyone at work is satisfied--but dissatisfaction with earnings provides the mainspring for self-improvement and skill enhancement so that each can climb that success ladder, offering his sharpened skills where they will exchange for higher prices. This motive power was of course what drove the uniquely successful American economy of the 1700s and 1800s, when government restrictions on enterprise were relatively few. Now that we have kicked back into high gear--indeed, overdrive--I'm anticipating a resumption in that explosion of wealth creation, and it has already begun. The next characteristic of work in our free society is that there has been a very high rate of change of jobs. That followed necessarily from the great walkout; millions of people were employed directly by government and many millions more, indirectly--something like half the population in total. More than three million left the military and schooling segments, for example; and it's been wonderful to see how the new labor market has swiftly absorbed them all, exactly as theory predicted. Less job-changing has been needed for indirect government workers--those employed by contractors--because the owners of those firms almost always anticipated the coming changes and re-tooled to produce things that real people might wish to buy--a nice case of beating swords into plowshares, in the case of "defense" contractors. Accordingly, many of those companies were able to re-hire those who had quit, or dissuade those about to quit. Nonetheless, the overall change rate has been huge, and that has triggered the emergence of successful job brokers and the very healthy growth of existing ones like the venerable monster.com and naturally, a large majority of the job-hunting and -finding was done prior to the actual walk-out. There have been a few who refused to face the reality of human nature and the inevitability of government collapse, and so who never did quit. These were always people at the top of the heap, mostly politicians who wouldn't understand Adam Smith if they fell face-first into a large-type copy of the Wealth of Nations. Most of these Neanderthals have gone to Mexico, though a few were smart enough to exchange their paper for gold before the former became totally worthless, and so are able to live here on what remains of their loot, and I did hear a rumor that the President had become a receptionist in the White House Museum--but it wasn't so. She fled the country and I don't know where she's hiding, nor care. Existing market work needs little comment, except to say that since all the stifling regulations have been removed, this part of the market has been enjoying explosive growth and has been recruiting actively, so absorbing a large part of the initial surplus of labor. This segment is the powerhouse of the rapidly growing American economy. One example I must mention is the low-price car business. 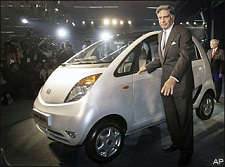 As long ago as 2008, the Indian manufacturer Tata produced a very simple 4-seater for the equivalent of 93 gold grams, but Detroit lobbyists have fought ever since to prevent this competitor being imported to the USA, on one pretext or another. That's all history now, and several comparable vehicles are being built and marketed in the new, free America with dramatic benefits for low-income families. At that price, it's feasible to afford one car per person rather than one or two per family, so the market potential is massive and work is proceeding round the clock. Replacement work has been very interesting to watch. There was a very large number of functions monopolized by government, but most didn't take a lot of resource; its main money- and labor-using activity was the useless and destructive one of redistribution. Roads, however, need maintaining and building, trash needs handling, justice needs maintaining, air traffic needs guidance, fires need to be extinguished, the occasional individual aggressors need apprehending and of course children need educating; the market has taken over all those and many more with for-profit, competing firms vying for business and doing the jobs very well for a fraction of their former cost. That big increase in efficiency means they do it with far fewer people, so there's been a large loss of jobs in such areas. It's been partly offset because the massive move to parental education (home schooling) has meant that millions of moms are no longer working outside the home and so many of their former jobs needed filling--in a wide variety of industries. So far, there has been some demand for armed protection, and companies formed for the purpose (associated with insurance companies) have employed a few former members of the US military and local police forces. The demand is mainly found along the Southern border, where private property faces land claimed by the government of Mexico ; there has been some concern that it might send an army to overrun such border properties, using focused force that individual defenders could not repel. Hence the use of insurance companies and flying squads of defenders ready to help under contract. It was a reasonable concern, but no such attacks have taken place (the Mexican government has its hands far too full, trying vainly to repress the re-education of Mexicans that seems poised to terminate its existence as in my first paragraph above), and so I anticipate this new industry will not prosper for long; though there will remain some demand for it, even in the heartland, for not everyone wants to keep weapons for his own defense. Insurance fits that situation well, given that the risk of aggression is so small. Repair work has been a very active market segment so far, and although it too will fade away, I think it likely to continue for several years yet, for the mess government has left behind is enormous. This "scavenger" segment is new and has been a large-scale recruiter of labor--often of the very people who helped create the mess in the first place, since few are better qualified to mop it up. It's interesting to note where the money is coming from. If there were still any statist economists around (there aren't), they would have argued that activity like this is an example of the "free rider" problem that the market (they said) cannot solve. Hence, creative people get the job done and make fortunes (the biggest so far has been made by the founder of "Silk Purse Enterprises") while hiring others to do the work at good pay rates; and the community gains a clean-up. As always in a free market, everybody wins. New-market work--the fourth type, above--is the most exciting and bears most promise for the future. I anticipate a rapid and endless expansion to come. It is fairly bristling with opportunities for innovators and those who they employ. Hundreds of new segments have opened up, with opportunity for investors and employees alike, even in these first few years of the free society--and already hundreds of thousands of new enterprises are at work, often sole-owner ventures or family firms, for everybody's newfound freedom fits very well with founding and running one's own business. You'll not want a catalog, so I'll mention just three segments. One that I love is the personal-flight industry. That idea is a whole century old, but implementation was not feasible while government regulated the skies and the market was limited anyway to those with strong flying skills. In recent years, however, entrepreneurs have developed both inexpensive helicopters and car/plane hybrids and collision-avoidance, navigational and automatic-piloting aids so that for little more than the cost of a good automobile, personal aircraft can be flown safely from one's back yard to pretty well anywhere, with very little training, almost as easily as using a point & shoot camera. This is a market with huge potential and all levels of skills are in demand, from aeronautical and software engineers to assembly workers. Another is in the medical research field. Biochem and gene-splicing are hardly new, but with government nannies no longer brooding over the science with superstitious, censorious eyes, the promise of stem-cell cures is now really paying off. Cancer is not quite history yet, but it will be within a decade. Amazing things are being done for burn and accident victims, to grow bone and tissue that was destroyed--and even for neurological diseases, hitherto incurable. Nanotechnology too is fast fulfilling its promise, with incredibly tiny computers circulating in the body to do the surgeon's bidding. All this work is naturally the province of the best-educated, but creative business people play a key part also, in bringing the techniques to the market so that all can reap rewards while providing all in need with the best and latest in treatment. This is what markets do best! Space continues to beckon, and if Robert Heinlein and Arthur Clarke were still with us, they'd be in hog-heaven. The pioneering work of the Spaceship Company in 2005 was repeatedly hobbled by the FedGov's NASA monopoly, but that's now history and they succeeded this very year in taking a party of paying passengers on a trip to the Moon--and back, the most important bit. Ticket prices will tumble as they did for air travel under Dickie Branson's grandfather, so in the next decade I look for many thousands of people to go on that awesome trip. Meanwhile, employees and investors are delighted and plans are afoot for the first tour to Mars--and Donald Jr. is buying immortality by donating 40 gold tons on condition that the first landing place be named "Trump Field." Overall, workers in our free economy enjoy enormous variety and exciting challenge, and we perform always in the knowledge that we're in full charge of our own futures and that success depends entirely on ourselves. This contrasts sharply with the deadly boring nature of dead-end jobs in the old world but is in perfect harmony with the true nature of self-owning men and women--and mankind can now achieve whatever he works for. In his thought-provoking book "The Closing of the Western Mind", author Charles Freeman showed that the brilliant progress of the ancient Greek and Roman world in terms of math, science, engineering and culture was interrupted in the 4th Century by the deadly alliance of church and (Roman) state. That postponed progress for a thousand years, until the Renaissance rediscovered some of the old rational thought patterns and the Age of Reason developed and exploited them as the influence of throne and altar, which Robert Ingersoll called "two vultures from the same egg", was further reduced. Now, following E-Day, I believe the human race is poised for an almost unimaginable leap forward, greater by far than either of those major milestones in Western history; for at long last, the mind of man has been liberated from both superstitions. Now, there is nothing to stop him.